Do you want to be Tom Brady of the tailgate? If so, this dip will do the trick! It’s the perfect mix of spicy and cool and will make you go mmmh. Serve it with pita or tortilla chips, or the vegetable of your choice. Bake 20 minutes or until mixture is heated through; stir. Garnish with chopped green onions if desired. 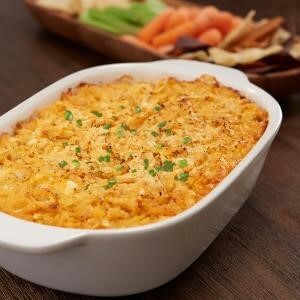 This recipe originally appeared on http://www.franksredhot.com/recipes/franks-redhot-buffalo-chicken-dip-RE1242-1.